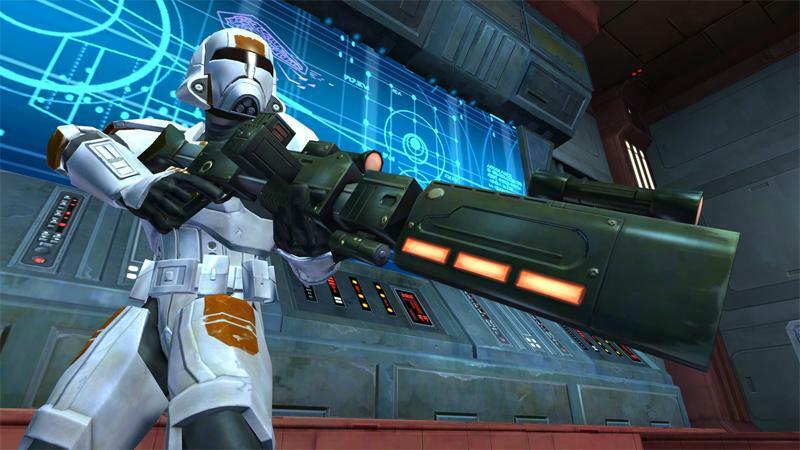 Here are the latest details on the Trooper class in the highly anticipated Star Wars: The Old Republic, MMO, RPG. The game has been in development forever now and will be out for the public sometime in 2011. Along with the Troopers being one of the most advanced fighting class in the galaxy, choosing the Trooper class will allow you to pick between Commando or Vanguard character. Meet one of the Trooper’s more irreverent companions, Tanno Vik, an ex-military demolitions expert who really loves his job. Humans aren’t the only species who step up to defend the Republic. The indomitable spirit of the Zabrak has lead many of these aliens into the ranks of the Republic’s finest. Learn more about this proud race on the Zabrak Inhabitants page. Troopers are given access to the high-powered Rendili Hyperworks BT-7 Thunderclap, a heavily-armored starship powerhouse upgraded with state-of-the-art tech requisitioned by Republic Special Forces. The Trooper’s dedication to the Republic and its ideals fuels a powerful drive for victory, even in the face of overwhelming odds. Watch the Trooper Class Video to see what drives a Trooper – and what they do to those who threaten the Republic. This comes straight from the Bioware Site.